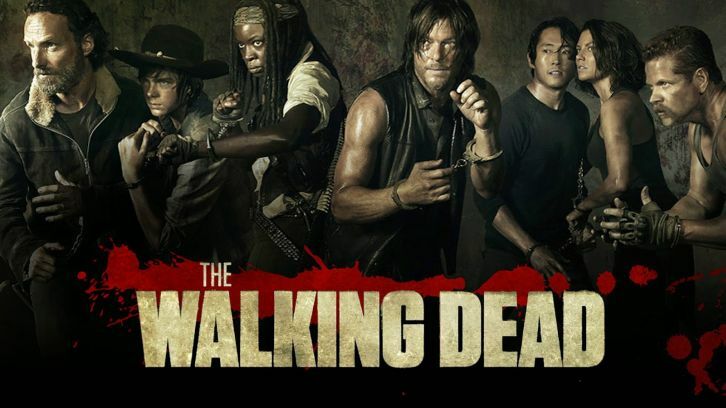 The Walking Dead, “Try,” was written by Angela Kang and directed by Michael E Satrazemis. As we might expect with the penultimate episode of the season, this episode really ratchets up the tension for what is going to happen in the season finale. 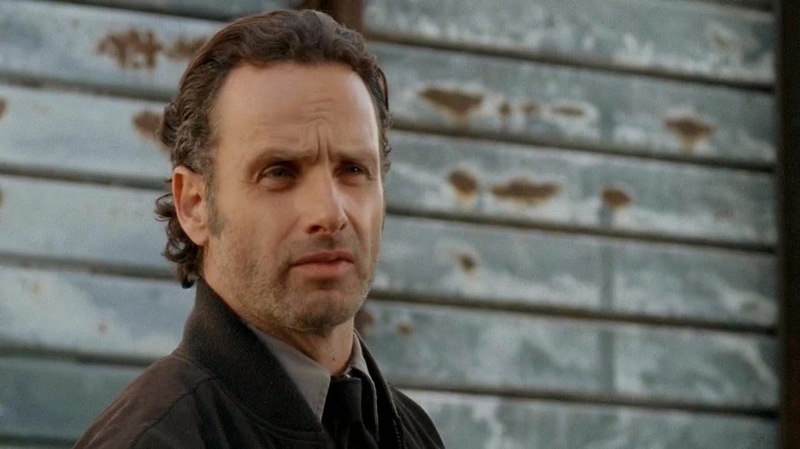 Tensions rise as the Alexandrians and Rick’s (Andrew Lincoln) group realize how different they are. The title refers not only to the groups trying to adjust to each other, especially Rick’s group’s attempts to re-enter ‘civilzation,’ but also is a nod to trying someone as in a trial. How does one weigh someone’s value to the community against the threat they may pose? It’s another finely crafted episode with brilliant performances from Andrew Lincoln, Tovah Feldshuh (Deanna), and Steven Yeun (Glenn). As the episode opens, Deanna, Reg (Steve Coulter) and Spencer (Austin Nichols) sit silently, clearly still in shock over Aiden’s death. 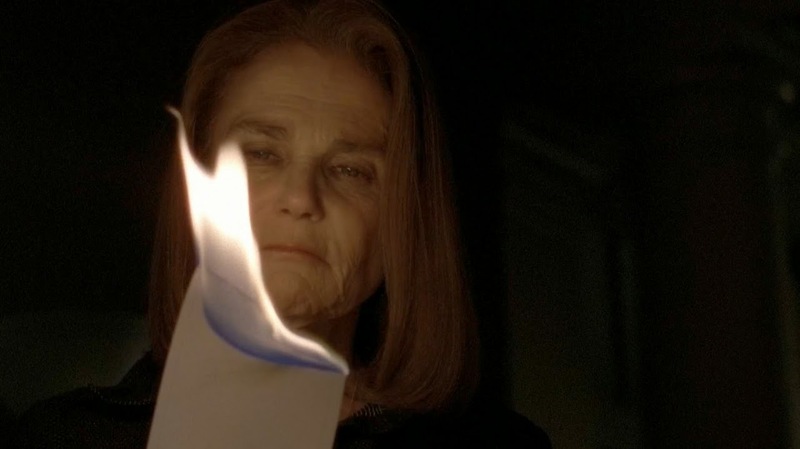 Deanna puts in Aiden’s Run Mix and the Nine Inch Nails song “Somewhat Damaged,” pounds through the opening scenes. The song has been described as being about succumbing to heartlessness, but it’s very much about finding that the person who was supposed to always back you up has abandoned you. 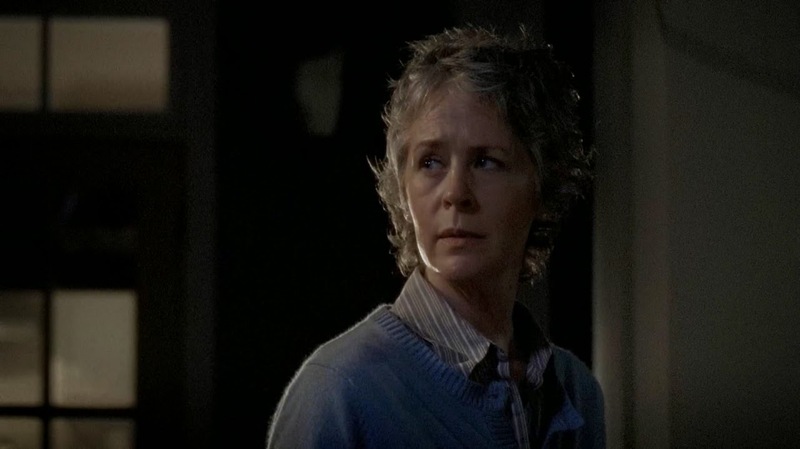 The lyrics declare “tried so hard to be like you” as the scene shifts to Carol (Melissa McBride) baking a casserole, looking at Judith on the baby monitor and writing a sympathy note for the Monroes. As she works, she looks up and sees Sam (Major Dodson) peering in the window at her. 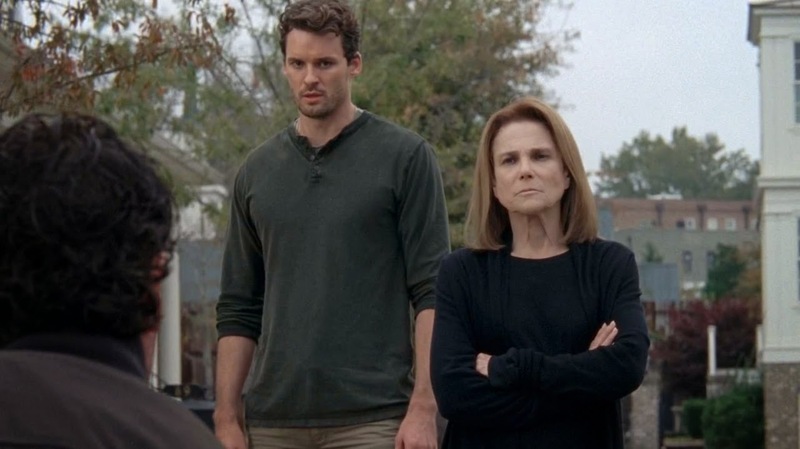 Carol is still going through the motions of trying to fit in, and it’s not surprising that she has a hard time writing the short sympathy note: “We’re truly sorry for your loss.” They aren’t sorry because they know that it’s Aiden’s and Nicholas’ (Michael Traynor) fault that Noah is dead. Sam wants to learn how to become strong like Carol in order to save himself and his mother from his father. The music was a perfect way for Aiden to try to give himself courage when going out on runs. Reg can’t stand it, however, having remained sheltered within Alexandria, he – like the other Alexandrians – really has no concept of what it takes to survive anymore. It’s Spencer who turns off the music as Deanna goes to the door and discovers the casserole that Carol has abandoned on their doorstep like an orphan baby. 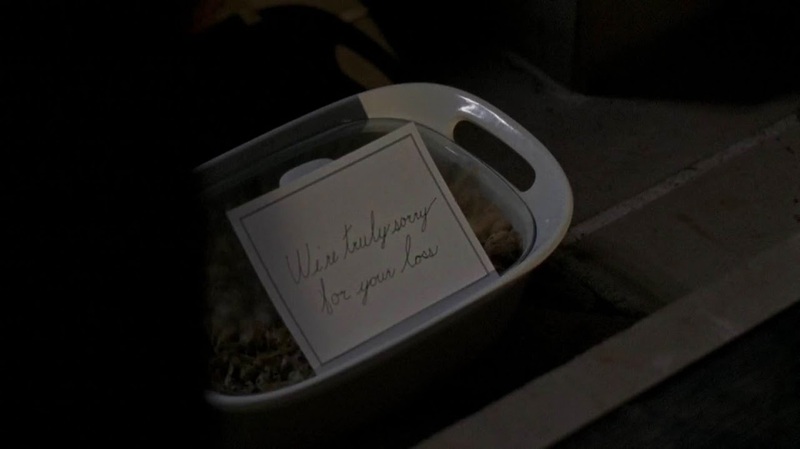 Deanna takes the note and leaves the casserole, only to burn the note. She clearly sees the insincerity of it, and it nicely foreshadows the ending of the episode and what must be a burning of bridges with Rick. The next scene cuts to Aaron (Ross Marquand) and Daryl (Norman Reedus) scouting. Aaron notes that there are more walkers around than before. Daryl is the one to notice a fire in the distance. Fire, it seems, is a symbol for conflict. 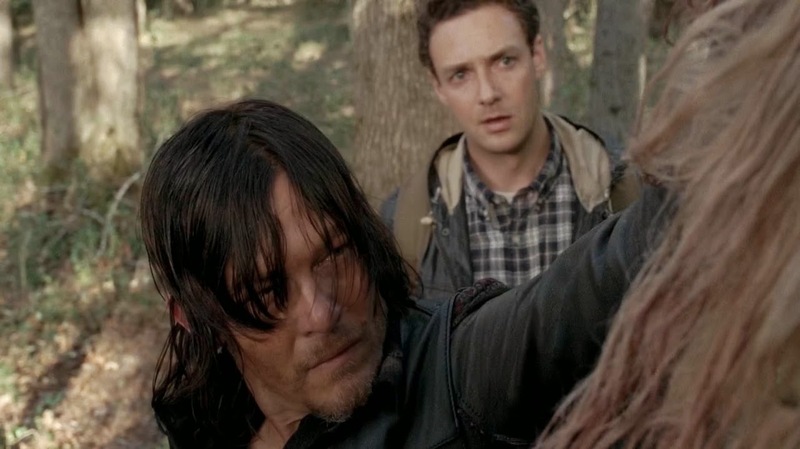 Daryl and Aaron’s discoveries in this episode begin to bring together a number of clues we’ve seen in recent episodes, pointing to an inevitable conflict, much like Terminus last season. They come upon body parts – but no heads or torsos – as they found in “What Happened and What’s Going On.” It seems we’re getting closer to what’s going on. We also see walkers with that “W” carved in their heads. Most gruesome of all, Daryl and Aaron find a naked woman who has been tied to a tree so that walkers could devour her alive. Daryl raises her head just as she turns, and he ends her. 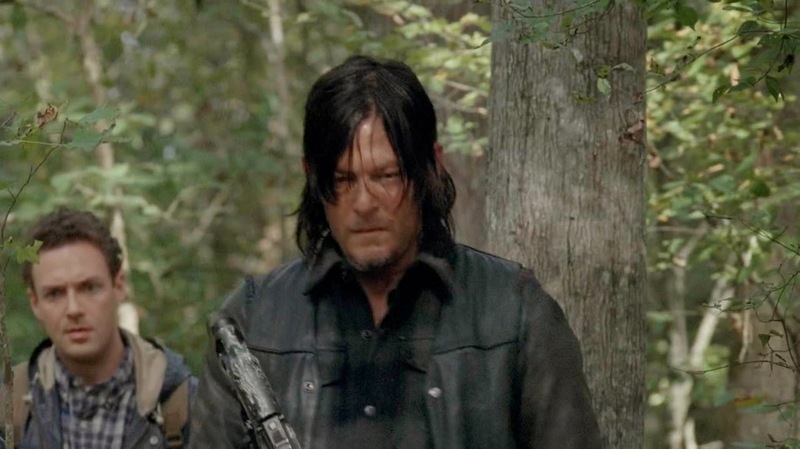 Aaron is absolutely horrified, but Daryl has seen enough to be more worried than simply horrified. I loved the cutting together of Glenn and Nicholas’ de-briefings. Deanna has distanced herself from the entire thing and we see her watching the tape of the interview. By contrast, Rick sits across from Glenn, close but not touching, bearing witness. The two versions of events are spliced together. Nicholas says that Aiden tried to save them, but Glenn distracted him. Glenn tells Rick he saw the grenades and tried to stop him. Nicholas says they just wanted to go; Glenn says he was gonna run. Nicholas maintains he wasn’t going to leave either Tara or Aiden; Glenn says they made him stay but couldn’t save Aiden without more help. Nicholas maintains they were trying to kill him in the lobby; Glenn says all Nicholas had to do was hold the door, but he panicked. Glenn is focused on his having lost Noah, having watched him die and his grief over that is palpable. Nicholas is only focused on himself, that they were trying to kill him and that they did this. Yuen is wonderful in this scene. Deanna tells him, “You don’t know what I see, Nicholas. And I see a great deal.” She sees through his story, just as she saw through Carol’s note. She sees that Rick and the group aren’t like them, but she also sees that Alexandria needs something more to be able to survive. 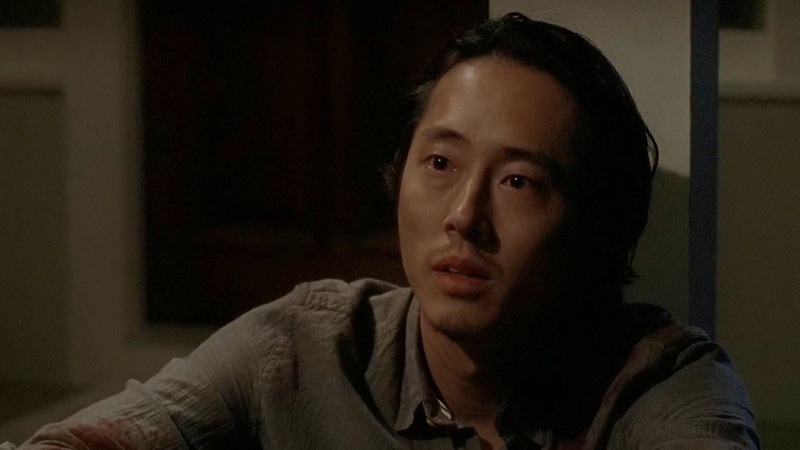 Glenn tells Rick that he thought about leaving Nicolas out there, killing him, telling a story. Rick doesn’t disagree that that might have been a good option. 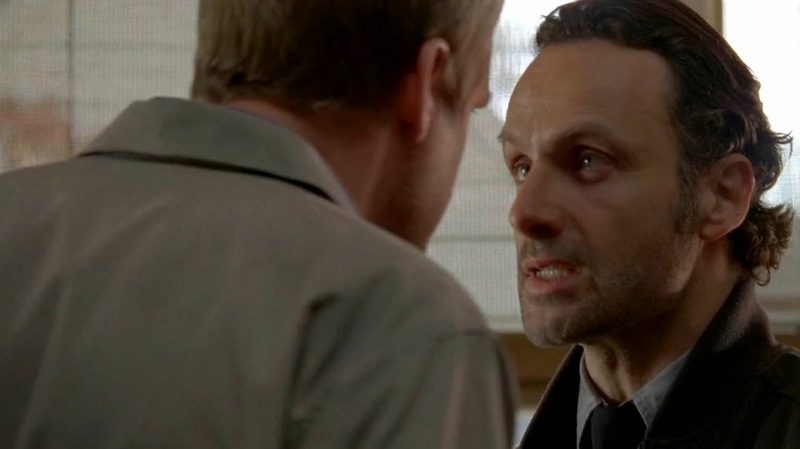 Rick tells Glenn that the Alexandrians don’t know what they’re doing or how things really are. Glenn wants to show them, maintaining that they have to be her. Rick agrees, but asserts that they don’t have to abide by their rules. Rick still sees them as “them” but Glenn tries to tell him that they are all one group now – there is no “us” and “them.” I found it really curious that Maggie (Lauren Cohan) was nowhere to be found in this episode. Where is her support for Glenn? 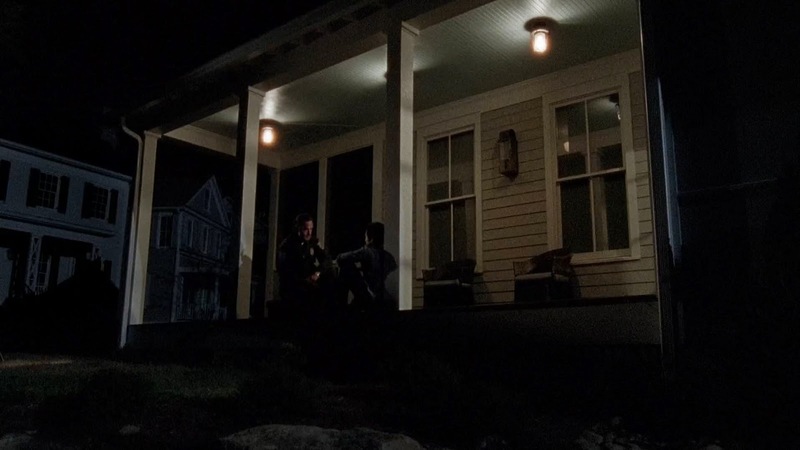 Rick and Carol watch Jesse (Alexandra Breckenridge) and her boys on her porch. Carol tells Rick more of what Sam has told her, feeding the fire she knows is growing in him. She tells Rick that Jesse put a bolt on the inside of Sam’s closet and told him to lock himself in and stay there until morning when Pete (Corey Brill) got angry. One night, he said it got quiet, and when he came out, his mother was unconscious on the floor and Pete was sitting on the porch. 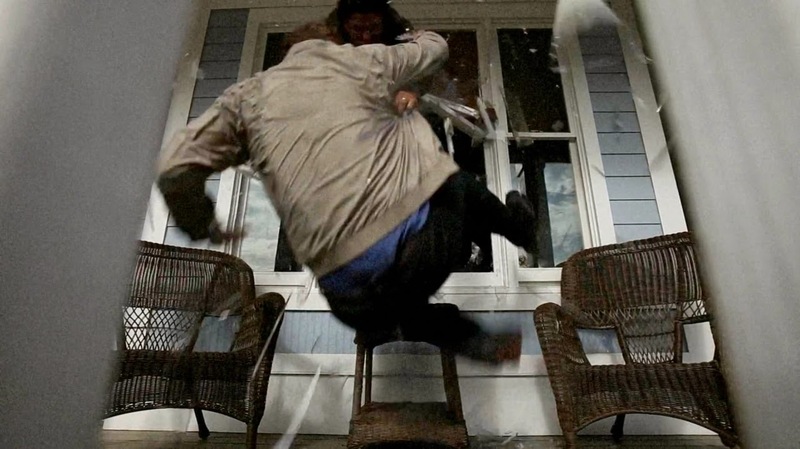 Was that the night after Jesse cut Rick’s hair and he saw Pete sitting on the porch? Was the beating for cutting Rick’s hair? Rick questions why Carol cares, and she says he knows why – it’s because she was a battered woman too. Carol believe she’d be dead if Ed hadn’t been killed by walkers but Rick knows her better than she knows herself. He knows her strength would have carried her through. I loved Rick’s little smile as he says, “Yeah. You would” still be standing there. Carol tells Rick she know why he cares – she’s seen him talk to her. Rick then walks down to the pond where he sees a red balloon tied to a toy boat. Anyone else wonder where the helium came from for the balloon? Regardless, it’s a nice symbol of the balloon of peace that is about to burst in a flurry of bloody faces and fists. The boat, of course, is Sam’s and it’s when Rick sees Sam running with it at the end of the episode that he decides he must act. Here at the beginning of the episode, he appears to hope that he can still warn Pete off. Pete stops to talk to Rick, thinking his status as doctor and surgeon makes him untouchable. 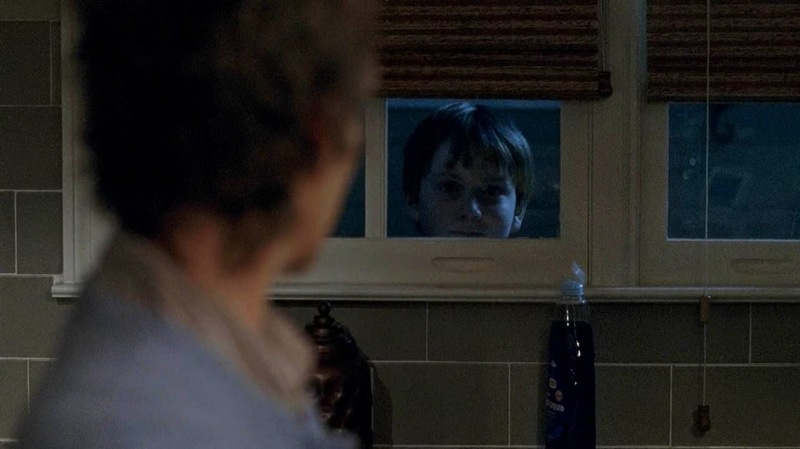 Lincoln is terrific in this episode as he turns to Pete and gives him a lethal stare. Rick simply tells Pete to “Keep walking.” Does Rick already see him as a walker? A threat to simply be eliminated for the greater good? Regardless, Pete walks away knowing that Rick knows. Rick is shocked to find out that Deanna knows what Pete’s been doing. They needed his skill as a surgeon so she was willing to look the other way – he’d saved lives after all. They disagree vehemently on what to do about Pete. Rick wants to stop him. Rick insists they give him the chance to simply stay away from Jesse. 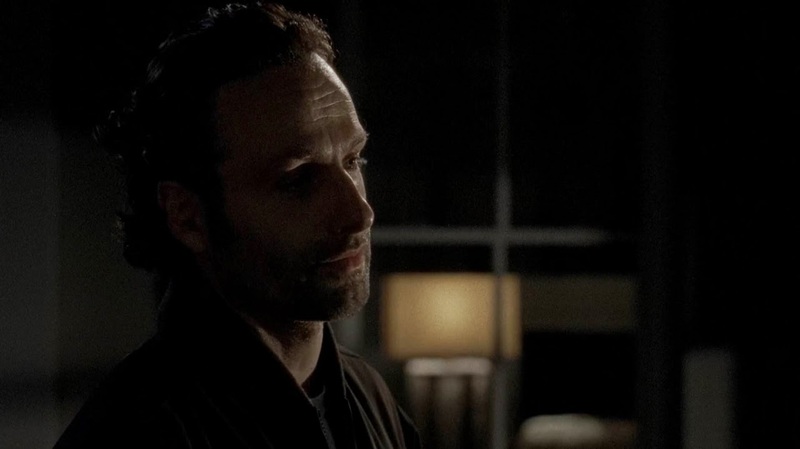 Deanna wants to know what happens if he refuses, and Rick doesn’t hesitate to say, “I kill him. We kill him.” Deanna is appalled, saying this is civilization. The don’t kill people, but she is willing to exile him. 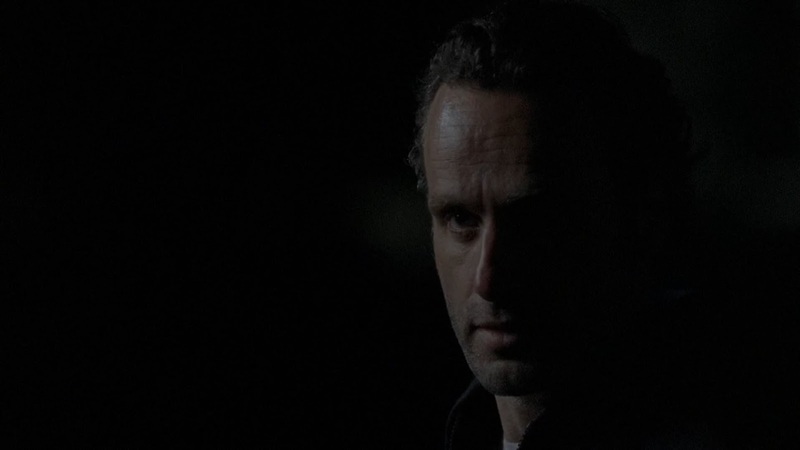 Rick says it’s too dangerous to let him go – look at the Governor. Letting him go makes them all vulnerable to outside attack. 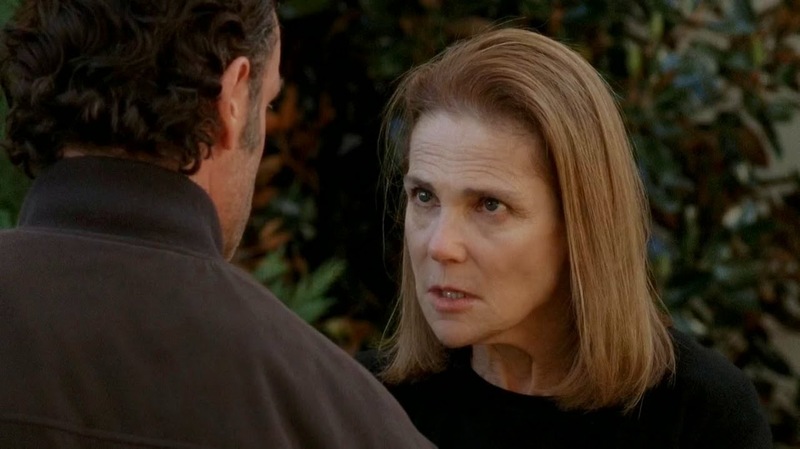 Deanna tells Rick never to speak to her about executing anyone ever again. Rick insists that people die no matter what they do, but “there’s times like these you can decide who and when or it can be decided for you.” Deanna replies, “It already was. I wouldn’t kill you. I’d just send you away.” This is a complete reversal of Rick and Carol from last season when Carol took matters into her own hands and Rick sent her away. I really liked how the women in this episode came together. It was particularly refreshing having just come from an academic conference at which, in my paper session at least, there was a lot of bashing on the women characters not being strong – or strongly written. 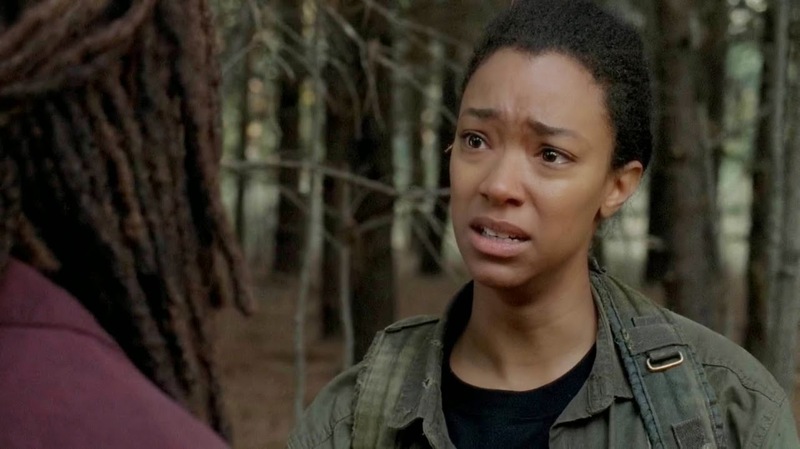 Sasha (Sonequa Martin-Green) is having a hard time dealing, especially now that she clearly feels guilt over Noah’s death because she told him he wasn’t going to make it. We first see her alone in the watch tower, struggling to keep her emotions in check. Yet she isn’t alone. 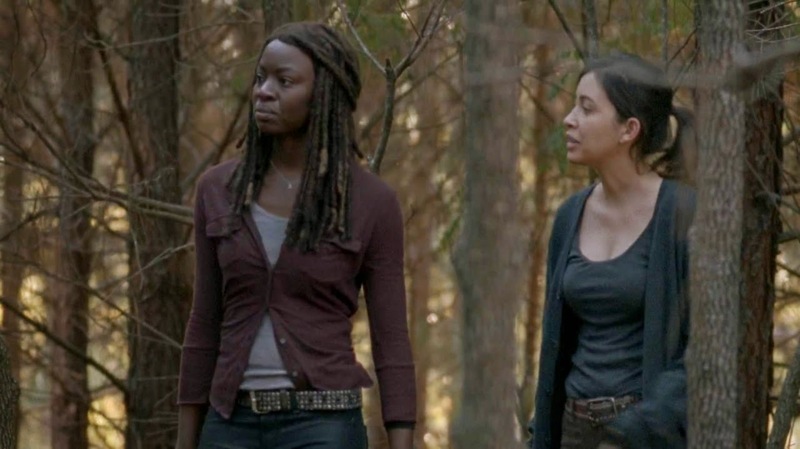 Just as the others are watching out for Tara (Alanna Masterson), they are also looking out for her and Rosita (Christian Serratos) reaches out to Michonne (Danai Gurira) rather than any of the others. Michonne is also struggling to adjust. We see her lying in bed fully clothed on top of the covers. She gets up and looks at the trappings for civilization – clean laundry, plentiful clothing. Rather than choosing something from the basket, she lays out her new uniform, but when Rosita comes to take her to go after Sasha, Michonne doesn’t put the uniform on. However, she also doesn’t bring her katana, and Rosita tells her, “You didn’t bring your sword with you. That’s not nothing.” It’s the first time outside of Alexandria for both of them, and Michonne says it already feels different. Rosita says that’s good, but Michonne isn’t so sure. After all, if they lose their edge and are forced to live outside again or have to withstand an attack will they be able to survive? 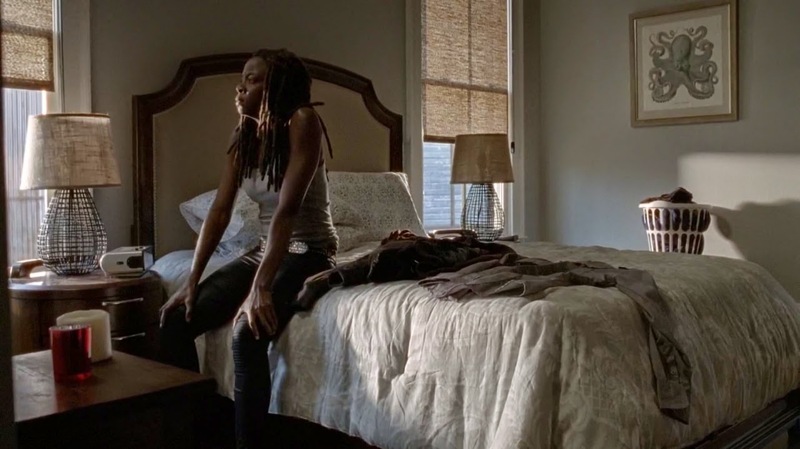 At the prison, recall that Michonne kept going outside the walls on her own, looking for the Governor. Rosita tells Michonne that she was screwed up after learning the truth from Eugene (Josh McDermitt) because she’d lost something – she’d lost the hope of the horror coming to an end. She says Michonne seems screwed up because she’s found something. Michonne says she felt like she was asleep inside the walls. Rosita suggests she was just trying to forget but Michonne insists that she doesn’t want to forget. Rosita says, “So don’t, but that doesn’t mean you have to give up.” It’s still important to try to fit in. 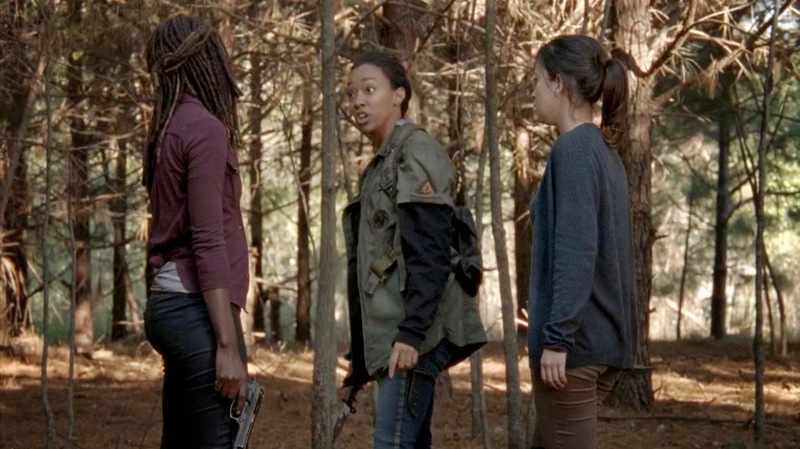 Rosita and Michonne realize that Sasha is hunting the walkers. She tells them she’s tired of playing offense. Of course, it’s impossible not to wonder where she’s getting all her ammunition. They are almost overwhelmed by the herd of walkers, but Sasha keeps insisting she doesn’t need their help. Michonne tells her “this isn’t about you” as she blasts walker after walker, flashing back to what she came back from herself. It’s a place she never wants to go again. Sasha tells her “It worked out for you. You can’t help me.” Sasha is right in that she has to want to come back from this place of darkness as Michonne did, but Michonne had Rick, Daryl and the others to help her. 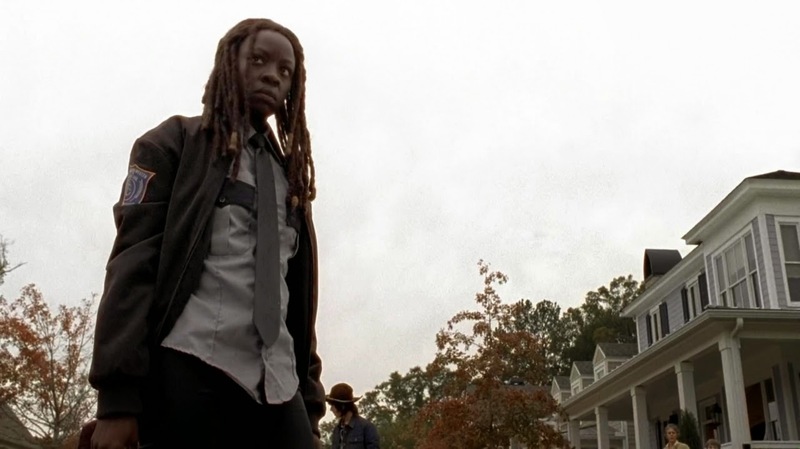 While the ending of the episode is initially shocking, Michonne, in the guise of her uniform again, putting an end to Rick’s rant was the best way to attempt to save him. 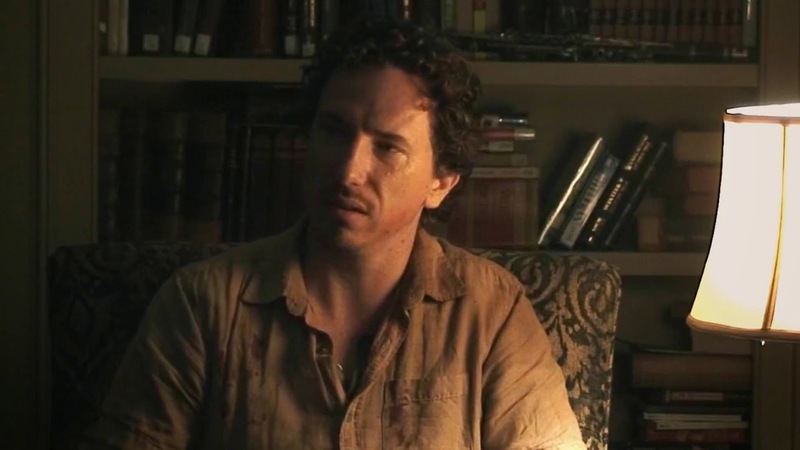 Glenn also reaches out to Nicholas to help save him to – or at least to try to save him. 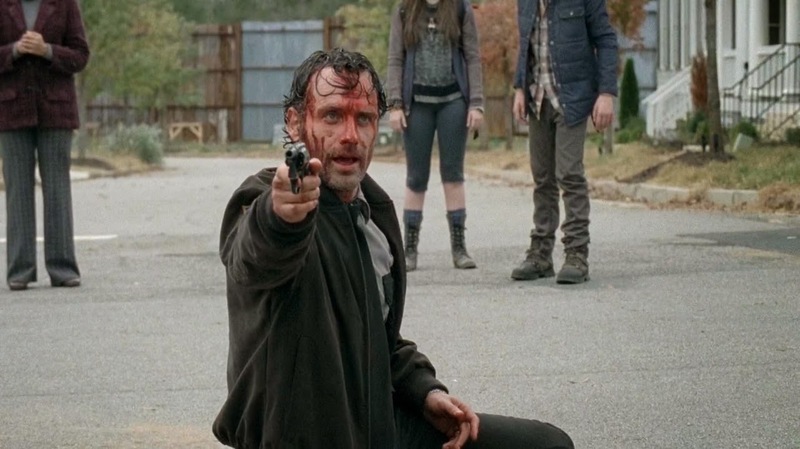 Nicholas sneaks outside after Deanna forbids it, and we see that he was the one to take Rick’s spare gun – and now presumably, Nicholas has it within the walls. I loved the scene in which Glenn goes to Nicholas who is cleaning the blood out of the van – the blood that he’s responsible for. Yuen delivers a very powerful performance in this scene, and it really drives home the kind of leader that Glenn’s become. Unlike Deanna, Glenn moves right into Nicholas’ space and tells him, “Don’t’ talk. Just listen. Those four people you lost on that run? That’s on you. And Noah? That on you too. Those five lives. You have to carry that.” Nicholas actually has the decency to at least look uncomfortable here. Traynor is clearly also doing a great job for me to hate his character so much! 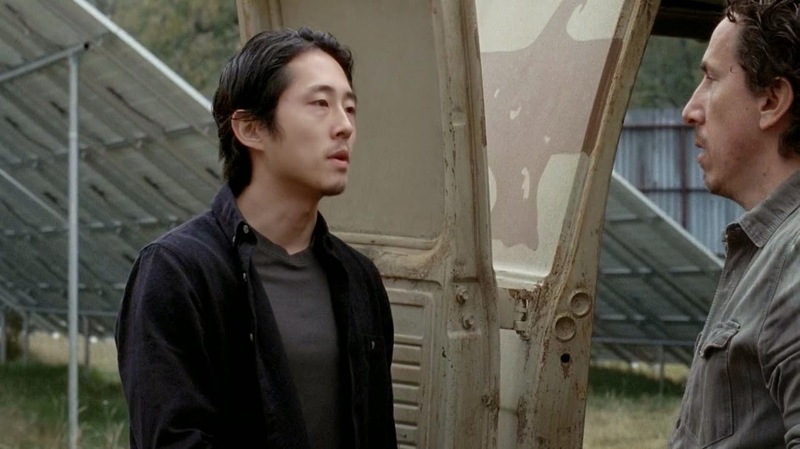 Glenn goes on: “people like you are supposed to be dead, but these walls went up just in time so you’re not. You don’t go outside those walls anymore. And that’s how you’re going to survive.” Nicholas has some meaningless bluster at Glenn, but he simply ignores him. 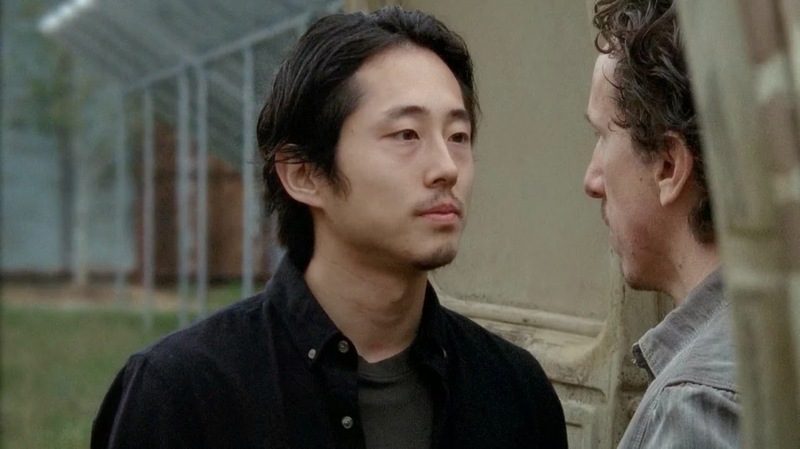 In response to who the hell do you think you are, Glenn tells him, “I’m someone who knows who you are. I know what you did. And it’s not gonna happen again.” When Nicholas asks if Glenn’s threatening him, Glenn tells him “No. I’m saving you.” And of course all the other lives Nicholas would take with him or before him. Carl (Chandler Riggs) and Enid (Katelyn Nacon) bond outside the wall because they are different from the kids who have been behind the wall. They have a conversation that is almost parallel to Michonne’s simply underscoring how they are not children. When Carl asks what she’s doing out there, Enid replies, “Same as you,” and they take off running. This is a nicely shot slow motion sequence, like something you’d see in an over the top romance. There’s something erie about their carefree romping as walkers roam the forest in the background. Enid says, “We’re supposed to be out here. We’re supposed to feel like this. I don’t want to forget.” Carl says he can’t forget. The two are almost like adrenaline junkies. When Carl asks what happened to her before, Enid says it doesn’t matter. Bad things happen to everyone, everyone dies. But Carl insists that it does matter. What you do matters, and what happened to you matters. They both like Ron (Austin Abrams), but neither will ever be as close to him because he doesn’t have their shared history of trauma. Carl asks Enid why she’s afraid of him. She doesn’t answer as they are interrupted by a herd. The two hide in the very tight recess of a tree, watching the walkers. Enid says to Carl, “It’s their world. We’re just living in it.” I can’t imagine any adult saying that, and it’s a wonderful throwback to what Rick said in the barn about kids who grow up now, not knowing the society of the past. The tension ramps up the longer the two are pushed into such tight corners. Carl brushes her hand – the hand holding her mother’s knife. It’s clear this is something else they share – a traumatic memory of their mothers. 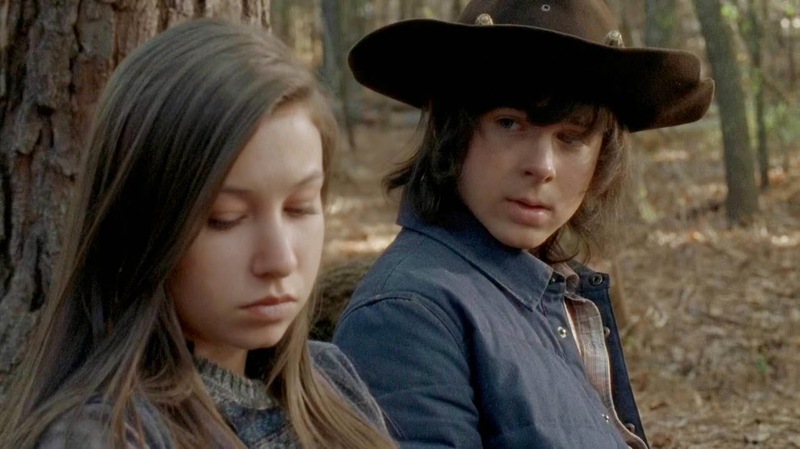 It almost looks like Carl may lean in to kiss her, he clearly wants to, but he doesn’t. Enid finally smiles and says, “Cool. You’re afraid of me too.” Everyone does die, seemingly, so how do these kids learn to trust enough to open themselves up to feeling about someone when they are convinced they will only lose them? Jesse insists that she was able to stop it before and can do it again now. Rick, as a cop, would no doubt have had plenty of experience with domestic abuse. Jesse insists it’s none of his business and that she can handle it. She wonders why he would risk the newfound safety and home he’s just gotten for him own family for her. Rick says he just wants to help, but Jesse insists, “I don’t know that. I’m married. I can take care of myself. We have to take care of ourselves.” All of which sound like platitudes that have been said to her or that’s she’s said to herself. Rick tries to walk away. He looks at the peaceful scenes around him – the things at risk for him if he stirs up this hornet’s nest that nobody wants to know about. Because at the end of the day, domestic abuse during the zombie apocalypse is no different from domestic abuse anywhere. He realizes watching the boy walk his dog and the woman on guard duty just reading a book – not watching – are completely oblivious to every danger around them. They can’t protect themselves and aren’t willing to see their own danger so what hope is there for anyone else to save Jesse? 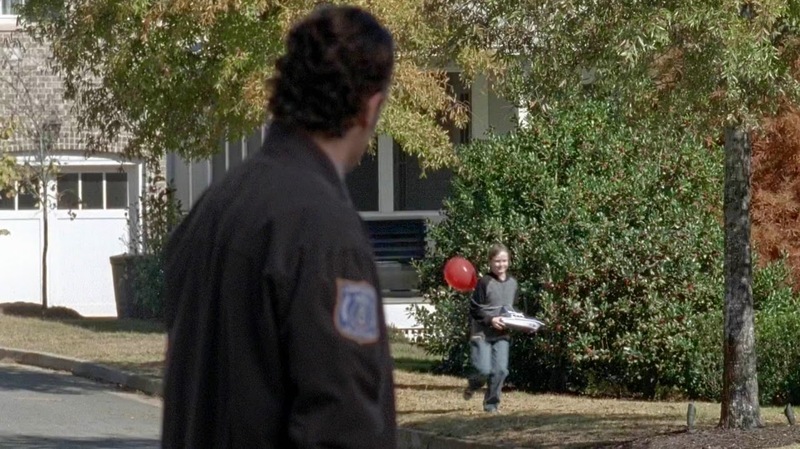 Finally, Rick sees Sam running with the boat with the red balloon, and it’s like the red cape to a bull. He turns around and goes right back to Jesse. He immediately tells her, “Sam asked for a gun to protect you. In here, you can’t see it but in here, it’s the same as out there. We have food and roofs over our heads, but you don’t get to live, to put I off or push it away. If you don’t fight, you die. And I don’t want you to die. I can help you. I can keep you and your boys safe. I can. All you have to do is say yes.” Rick is still concerned with saving as many as possible – and he’s now down three. During this scene, his hand hovers near her, but he doesn’t presume to touch her. Jesse asks if you would do this for anyone else, and Rick answers no. There’s a tear tracking down his face. This is simply an amazing scene, from Rick’s first confrontation with Jesse right up until Michonne knocks him out. Lincoln is simply magnificent. Pete bursts in and the situation quickly deteriorates. Rick tries to get Pete to simply leave with him, but I really got the feeling that Rick was probably better at this before, and certainly when he didn’t have feelings for the woman at risk. Pete then asks the same question that Nicholas asked of Glenn – who do you think you are? Rick’s answer is almost the same: “Someone whose trying not to kill you.” Rick is both trying to control his temper, but in a larger sense, he’s also trying to get Pete to accept the separation option. It’s not to be, however, and we have a brutal fight scene that brings everyone running to the scene. We know that Rick is no slouch when it comes to fighting – though he does end up getting pummeled by both the Governor and Joe. Michonne saves him from the Governor too. However, it also shows how brutal Pete is – imagine if he were doing the same to Jesse or one of their sons? Sam runs up and hides behind Carol – the one person he is sure that can protect him. Carol remains aloof throughout, not tipping her hand. She will need to maintain her cover and invisibility if she needs to help Rick later on. Jesse tries to stop Pete and he backhands her away. 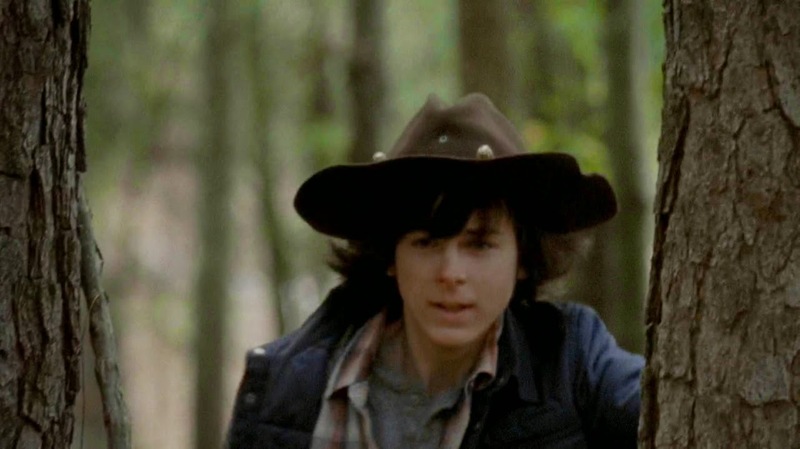 Carl tries to stop Rick and he pushes him away. It’s only Deanna who can stop it in the end. Deanna agrees that that’s never been more clear. Rick goes on incredulously, his fact covered in blood: “Me? You mean me” your way is going to destroy this place. Get people killed. It’s already gotten people killed. And I’m not going to stand by and let it happen. If you don’t fight, you die. I’m not going to stand by and….” And Michonne cuts him off. Now it will remain as to who will stand with Rick. I have to wonder if even some of the Alexandrians may stand with him. Tobin (Jason Douglas) was willing to concede that Abe (Michael Cudlitz) was better suited to protect them. Glenn holds both Tobin and Nicholas from joining the fray and Tobin does seem to look to Glenn for guidance. Might he see the same thing here? Or will some of the group turn against Rick to keep what they’ve found in Alexandria? I have a real feeling that the questions that may be raised early in the episode about what to do about Rick will be quickly resolved in an attack by the third party that is out there committing atrocities. What did you think of the episode? Do you think Rick is right about Pete? 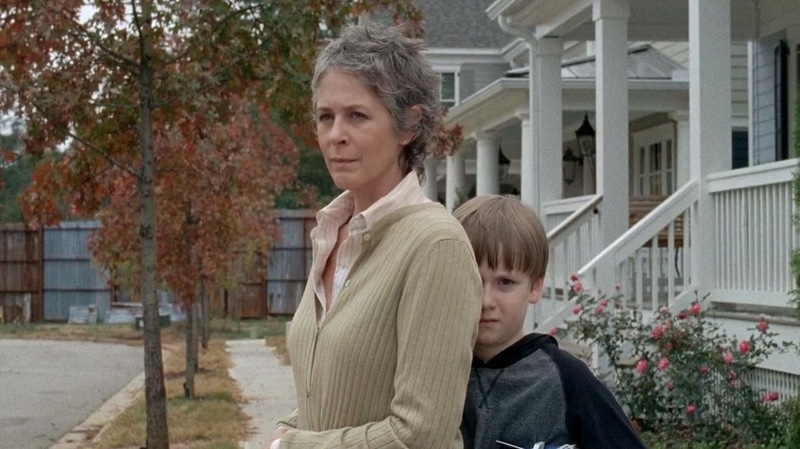 Did this seem eerily like Carol’s earlier storyline? What if anything should be done about Sasha? Is Nicholas also a clear and present danger? Let me know your thoughts in the comments below. A quick apology for missing last week’s review. A bout of the flu in the midst of travelling played havoc with my schedule. Look for a review of 5.14 after my review of the finale – consider it something to tide us over during the looooooooooooooong hiatus.